- Reduce and improve pimples and oily surface by face foam, ozone, facemask (Acne prevention), peeling and washing. - Firm up and close pores by cold water finally. - Washing and cleansing at first. - Massage face skin gently and carefully by using anti aging gel. - Remove dead skin cells and stain by face scrub which contains pearl extract. - Care for wrinkle skin by ozone and facemask. - Vitamin will be given for nutrition. - Hair wash and massage by warm oil and steam. - Bubble footbath will be applied for foot relaxation with massaging your back and hand. - Finalize hair treatment by washing, conditioning, tonic and drying. The traditional hair and scalp massage with cream bath and fine aroma will give your feeling as a queen in Keraton (palace) of Solo. The scalp massage will remove stains in pores and effect better blood circulation. The natural effective ingredient will be absorbed to your hair by permeating hair treatment with steam. The massage for neck, shoulder, arm and hand also will be provided with bubble footbath for your best relaxation. Your hair will become beauty and shining by hair conditioner, hair tonic with vitamin and will be finalized by using vapor of aroma “Ratu’s dedes” (Queen of Solo). Full nail grooming combined with massage for your hands to be smooth. Soaking in flower bath and nail art will make your nails look beautiful. It is also available a combination of nail painting with nail stone / nail sticker or French manicure. Full nail grooming combined with massage for your feet to be smooth. Soaking in flower bath and nail art will make your nails look beautiful. It is also available a combination of nail painting with nail stone / nail sticker. Full polishing and grooming for finger and feet combined with nail coloring and art. The treatment will make your nails be beautiful and be available to a combination of nail painting with nail stone, or nail sticker. Traditional Balinese Costume Photo included: 10 Pcs of photo size 4 R + CD + Photo’s file. Bali Ratu Shoulder & Head Massage. Full treatment for your feet relaxation to soften and energize feet and legs. The treatment will get over the fatigue and also make your feet beauty, healthy and smooth. * Peppermint foot spray to refresh, cooling and help to energize your feet and legs. Aroma therapy foot bath, Balinese SHIATSU massage. Shiatsu treatment is a dry massage by pressuring the body's points which useful to reduce tiring and effective for immune. Flower footbath, Body steam, Traditional Balinese massage, Shower. Inherited massage style from ancestor using traditional technique will be provided. 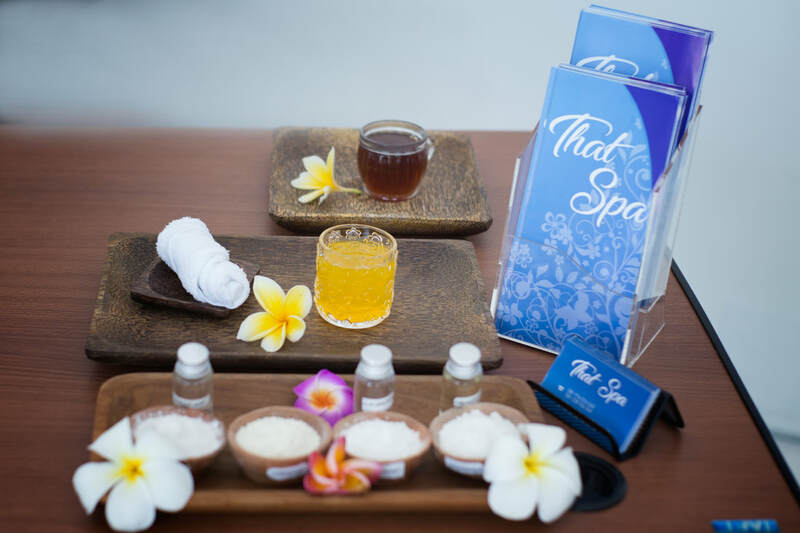 Starting with footbath, body steam to bring out the toxic from your body, and then traditional Balinese massage using aromatic oil from top to toe will be done in order to be better your blood circulation. 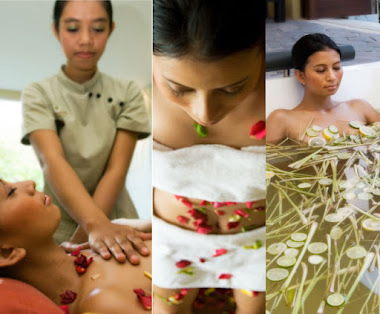 Therapy massage by warm stones and ginger oil in combination with traditional Balinese massage. It is effective for your better blood circulation, decreasing muscle tension, increasing stamina and healing your body and soul. Footbath, Herbal body steams in order to bring out the toxic, Body massage using warm stones to relieve stress, and finalize by shower. 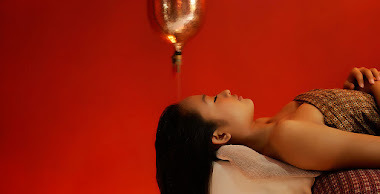 Therapy massage by warm herb ball, which contains natural ingredients from Indonesian spices, in combination with traditional Balinese massage. “Jamu” herbs will penetrate into your body and be effective to prevent fatigue and cold. Slimming cream will work efficiently for resolution of fat and make the bodyline become beauty. It is effective to make skin become beauty, bright and moisturized by the original essence included extra Vitamin-C. The indication of bust treatment is making the bust lift up naturally and beautifully by the cream (Collagen). It is effective for speeding-on the metabolism. And it will make the skin become stretching and shining by the extra nutrition supply. The indication of leg treatment for speeding on the blood circulation and making the leg line becomes beauty and slim. It is also effective to clear (up) the hip and waistline by mint which is found in combining of original cream. The leg will clearly look longer as your imagine. Hip treatment is recommended as an additional treatment to get better body. Speeding on the blood circulation around the hip, burning fat and poison, making the hipline lift up and let your body look beautiful. Leg treatment is recommended as an additional treatment to get the double advantage. The treatment by using original cream made from the essence of plants will be stretching the upper arm. It will make your skin become elastic, fresh and smooth by the essence contained extra herb.